Could the Phillies make a run at a proven, formidable hitter for the middle of their lineup this winter, someone who would immediately improve an offense need of an upgrade and who could reenergize a ballpark that’s been in the bottom third of attendance in the last two seasons? Even if the Phillies are still a couple of years from contention, it’s not that crazy of an idea or unlike when they signed Jim Thome heading into the 2003 season. If manager Pete Mackanin has made one thing clear during his team’s recent slide, when they’ve hit .195 as a team with a .262 OBP in the last three weeks and slashed .223/.293/.360 in their last 50 games, it’s that he could use some new personnel. A day later, back at Citizens Bank Park, Mackanin was asked about whether he’d like to have veteran pitcher Jeremy Hellickson back and managed to work the topic into that conversation, too. 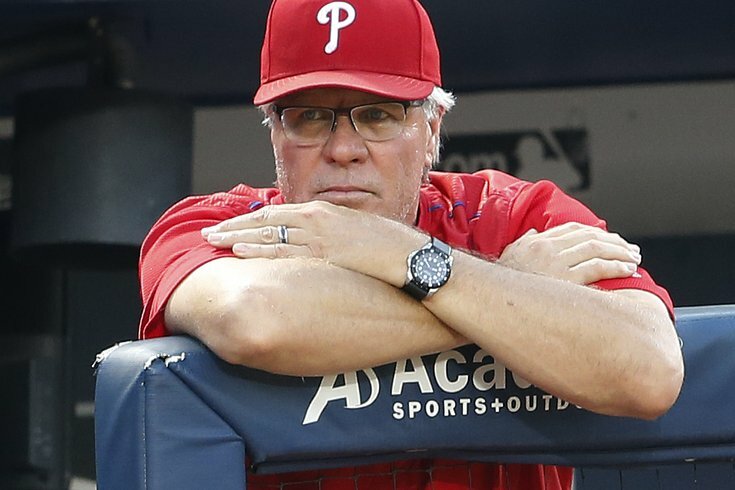 “Yeah I’d like to see him back, (Hellickson has) been a stabilizer for us,” Mackanin said. “He gives us a lot of innings. The best part about this year is getting a getting a look at all of our starters and we’re pretty happy with what we’ve seen from all of our starters. The first year manager was then asked about the recent report that the Phillies could seek two veteran bats on the free agent market this winter. Franco, who returned to the lineup for the first time in six games on Monday, has had a very unimpressive first full season in the major leagues. But there’s something to be said about giving a young hitter like Franco, who was the only young power bat in the lineup when the season began, some help in the form of a veteran who can take on the pressure of being the guy in the heart of the order. Not unlike Thome joining the Jimmy Rollins-Pat Burrell Phillies heading into the 2003 season, or Jayson Werth being signed to a young Nats core that had young superstars Bryce Harper and Stephen Strasburg on the cusp of their big league careers. So, after reading 571 words you’re wondering how long you have to wait before we throw out some potential names. In the aforementioned report, Jon Heyman identified Ian Desmond (a shortstop turned outfielder) and Martin Prado (a versatile infielder) as options. Yoenis Cespedes (who can opt out of his Mets contract) and Edwin Encarnacion are free agents who could easily be placed in the middle of any big league lineup, let alone the unproven Phils batting order. Yasiel Puig could be had in a trade (but he might be more of a project than proven, dependable hitter at this point). Perhaps the most interesting free agent name, however, is Jose Bautista. Bautista, who has made each of the last six All-Star teams, has had an injury-plagued season. And he turns 36 next month. But that may benefit a team like the Phillies, who have the financial flexibility (just $24.2 million committed to the 2017 payroll) to gamble a little with money in the next few years. Coming off an uneasy year, Bautista may want a five-year deal but have to settle for less. But, to be clear, this isn’t to say the Phillies will pursue a big free agent this winter. It is an intriguing idea, though. And it’s one Pete Mackanin would surely welcome. • Jorge Alfaro will “probably” make his first major league start on Tuesday night, catching fellow rookie Alec Asher against the Pittsburgh Pirates, Mackanin said on Monday. The 23-year-old Alfaro acquired in the Cole Hamels trade (with Asher and others), hit .285 with a .783 OPS and 15 home runs in 97 games at Double-A Reading this season, and those home runs do not include the two he hit in a postseason game on Friday night at FirstEnergy Field. When asked about how often Alfaro can expect to play in the season’s final three weeks, Mackanin said the athletic catcher would likely get between six to eight starts. • After Adam Morgan put forth his latest quality start on Sunday, Phillies starters have allowed three earned runs or fewer in nine consecutive starts, tying their longest such streak of the season. During that streak, the rotation’s 2.11 ERA is the best in baseball. (The Dodgers 2.23 ERA ranks second). • The Pirates enter Citizens Bank Park having lost 11 of their last 13 games. The Phillies and Marlins are the only teams in the NL that have scored fewer runs than Pittsburgh this month and only the Diamondbacks have a higher ERA than the Pirates (5.40) in September among NL teams. The Pirates (69-72) are six games out of the second Wild Card spot, and thus, are in danger of missing the playoffs for the first time in four years.